Another day, another outrageously expensive new menu item for people who hate having money: New York's Bagatelle has debuted a sundae clocking in at $1,000. 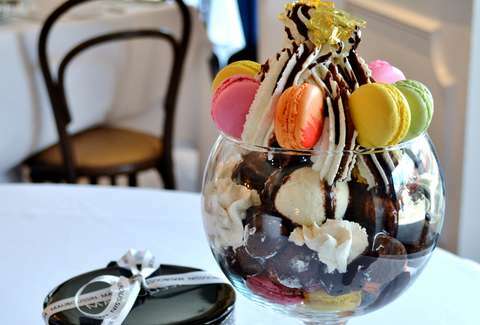 So what makes this particular dessert, dubbed the Mauboussin Mega Sundae, so damn pricey? Certainly not the plebeian vanilla ice cream scoops scattered throughout, or the commoner whipped cream on top. Chalk it up instead to the Dom Perignon Rosé sorbet, chocolate truffles, macarons, chocolate vodka sauce, and "gilded brownies" with edible gold leaf. Oh, and it also comes with a (completely inedible) ring made of white gold and black steel, created exclusively for Bagatelle and called the "Moi non plus/Toi non plus". You can order one of these sundaes now at Bagatelle. Or, if you value your credit score, just stay home with a Ben & Jerry's Salted Caramel Core paired with a $.25 ring from the vending machine outside the grocery store. Kristin Hunt is a food/drink staff writer for Thrillist, and would love to order a sundae with a nice assortment of arcade rings. Follow her at @kristin_hunt.